From GTD we have many productivity tools / hacks or techniques in use today, even if many of us are not using the entire system as set out in the book. 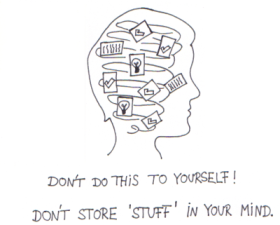 Document all the tasks you need to accomplish in a system other than your memory. Include tasks to be worked now and in the future. Include both work and personal tasks. Organise those tasks in order to be prompted by them, and to action them to completion. A key concept here is to batch tasks into similar context groups. Consult your lists or collections often so you’ll make wise decisions about the next task on which to work. A key to this routine is a weekly review. GTD is also intended to provide a system for dealing with tasks enforcing taking distracting things off our minds (called open loops). Overall, the system is designed to be external and trust-worthy – one allowing you to set and not be concerned you may forget something. The Collection stage – where all stuff is gathered together in an unstructured manner. This stage involves writing down everything you think needs doing (possibly using trigger lists), from all places where relevant information might accumulate (such as in folders and drawers) which are emptied into one place. These are called Open Loops (more below). or defer it, by assigning a next action to it and placing it on an action list. Or through the tickler system (43 folders). If not then we should look for any value the item has. Might the item suggest future action after further thought? Then the item could be incubated or put onto a sometime/maybe list. Does the item have archive value? Then file it. If the item demands no action, and has no future value, then delete or junk it. The Organize stage takes these sorted items and puts them together in a form than can be used through the day for allocating tasks to time. Typically, an organised to-do or task list (with various structural additions). Project Lists are for open loops which have more than one actionable task. Tasks are organised by context (@context) and priority. Context asks the question – where do I need to be to do the task? There is little guide in GTD for how to prioritise other than by energy, importance or context, but several other productivity systems may suit – tools like the Eisenhower Matrix, or Big Rocks First, or even Eat the Frog. Regular Reviews ensure the organisation is a system that can be trusted. Reviews will look at the collection buckets, when you enter a new context, your daily calendar or tickler system, and weekly review checks. Finally, through the working day, the Do stage uses the organised task lists to get things done. The recommended approach is to keep tasks small and clearly defined, and to choose the MIT – Most Important Tasks only. Lists/collection buckets: action list; calendars; sometime/maybe list; organised to-do or task lists; project lists and monitor or wait lists. Actions: do, delegate, defer, file, delete. Note: a GTD Workflow PDF is available from the GTD website (link below in further reading). 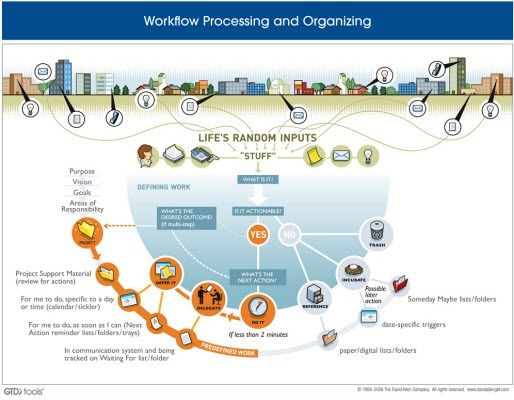 There are several other diagrams showing various GTD Workflows, one I like (below) is from eproductivity. Some of the highlighted concepts above have been discussed previously. Others will be defined below, or in later posts. More on context – see last Thursday’s post – Action and Next Action. More on Next Action – see last Thursday’s post – Action and Next Action. More on MITs – see last Wednesday’s post – Small Actions. More on The 2 Minute Rule – see last Wednesday’s post – Small Actions. More on Batching Tasks – see last Thursday’s post – Batching. More on Weekly Reviews – coming up this Thursday – Lists, To-Do’s and Reviews. In the 1920s, Lituanian-born graduate student Bluma Zeigarnik sat in a restaurant trying to decide what to write her doctoral thesis about. She noticed that the waiters had a knack for remembering complex orders. They delivered the right food to the right tables. But once the order was completed and paid for, the orders appeared to drop out of the waiters’ minds, to the point they struggled to recall them, if questioned later. Our mental energy is drawn to incomplete tasks. Once a task is dealt with, we drop it from our minds. Laboratory studies confirmed Zeigarnik’s thesis. The idea that our attention is distracted by incomplete tasks became know as the Zeigarnik Effect. Open Loops: anything pulling at our attention that doesn’t belong where it is, the way it is. Open loops, Allen says, can be to-do list items as big as “bring world peace” or as small as “replace ink cartridges.” The lesson is, people will experience greater relaxation and focus, and be more productive, when they learn to control the ‘open loops’ in their lives. In essence, GTD is a system for controlling open loops, so you can better focus on the task at hand. The entire system begins, day by day, by giving the mind a little time to blurt out any worries, new ideas, new tasks or other open loops – and then provides a process to deal with these, to close them off. In the full GTD system, or approach, open loops are generally captured into either a tool, or list entitled “In” – or the “Inbox” as many digital (and analog) systems supporting the system call it. Once there, open loops are processed via the general approach choices from GTD. David Allen and GTD talk at length on using an intelligent filing tickler system, but it was Merlin Mann who designed a system and called it the now famous 43 Folders. Mann’s now archived site remains a great place to visit for productivity tips. Merlin Mann is the person behind the Inbox Zero principles. 43 Folders is the advised analogue tickler system for GTD. Of course, many people use schedulers and calendar systems and apps now, as a replacement. Ordinary Manilla folders are used to store paper-based reminders of things to be done on a specific date or during a specific month. 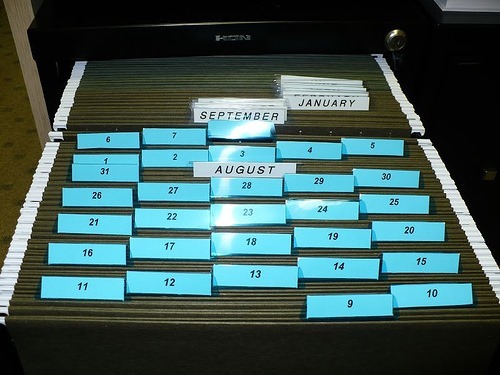 The system requires exactly 43 folders, one of each of the 31 days in the longest month and one for each of the 12 months. The folders are labelled with day numbers and month names and stored in a particular order. For example, on the morning of July 3rd, the folders would be in the following order: 3, 4, 5, …, 31, August, 1, 2, September, October, November, December, January, February, March, April, May and June. Every morning you look in the front folder to see if it contains reminders about things you need to do today. After processing the contents of the folder it is moved to its proper position after all the numbered folders behind the folder for the next month. If you’re into the retro tickler file setup, here’s a tip – the 43 folders system has day numbers but not names. But you can purchase bulldog clips from organisation or homestores with week days on them, or create your own using standard bulldog clips. Then simply clip them onto the relevant number files as they come up for the week ahead. Getting Things Done has had a lot of associated web discussions with slight changes in terminology. 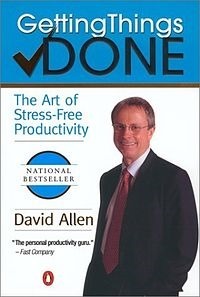 Terms like “Getting Stuff Done” or even “Getting Sh-t Done” crop up all over the place, generally following similar principles to David Allen’s books. But there is also a large group of people (and posts) who have found GTD as a full system to not work for them. Many people – like me – adopt some of the best practices out of GTD, or work with cut-down simplified or modified productivity techniques still based on GTD principles. GTD is a model, using many techniques and routines which were previously used by all kinds of business people, and remain useful outside of the full system. But the principles, where-ever they are sourced from, are useful within all of life – personally, or in work. Master Your Workflow Now and The One-Minute To-Do List (both books by Michael Linenberger) The 1-Minute To-Do List is available as a free ebook with website signup. Without knowing it at the time, I stumbled on a very cut down approach myself which in hindsight, and after finding a 2012 post by Lifehacker founder Gina Trapani, looks very similar to her approach of old. One such cut-down or simplified system, successful in it’s own right is Zen to Done. ZTD was created by Leo Babauta of Zen Habits, in order to resolve five issues some people have with the full GTD system. The ZTD approach is based on focusing on one habit change at a time, so adds in proven habit changing techniques like rewards and routines for motivation. The system promises to be more about doing, while GTD has a more collection and process focus. ZTD is designed as a simplification. What I enjoy out of the Zen to Done system is the focus on planning – at a simple doable level, using MITs (Most Important Tasks) and the Big Rock approach. (Big Rocks were discussed in last week’s post). The system is compatible and supplemental to GTD, but with a more simplified feel. Link: Zen to Done (purchase as ebook, audiobook etc). GTD and derivatives form much of the basis for many of today’s task management apps, either fully or partially. Other systems like Evernote or OneNote have hacks developed to introduce some GTD processing within (see The Secret Weapon as an example – link below). But many paper-based tools can be used with GTD processes. In fact, David Allen tends to use lots of notebooks himself, and the previously blogged Bullet Journal or Daily Logbook journaling systems are supportive of GTD. Todoist– my own system of choice currently – offering webapps, a windows app, iPAD and iPhone, and plugins for google mail. Zendone – web and apps, with Evernote integration. An extremely comprehensive Mashable roundup: GTD Toolbox: 100+ Resources for Getting Things Done. This was written in 2009, and there are no doubt many other apps out there since. The official GTD site’s Common tools and software listings. 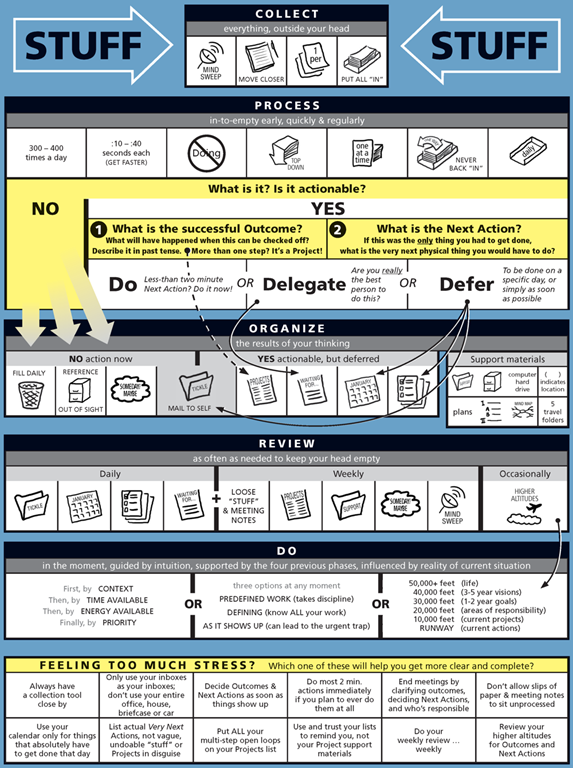 Getting Things Done flow diagram (pdf direct link) via the GTD website. The Secret Weapon combines GTD and Evernote – this is a manual setup for inside Evernote that uses GTD concepts like context tags. Over the last four blog post days, I’ve discussed everything from the Eisenhower prioritisation matrix, to Next Actions, then the 3P techniques (Parkinsons, Pareto and Pomodoro) highlighted in the book, 4-Hour Workweek, and today’s productivity techniques modeled in the book, Getting Things Done. Adopt one new productivity approach which looks valuable. Try it out for a week, then share your thoughts. 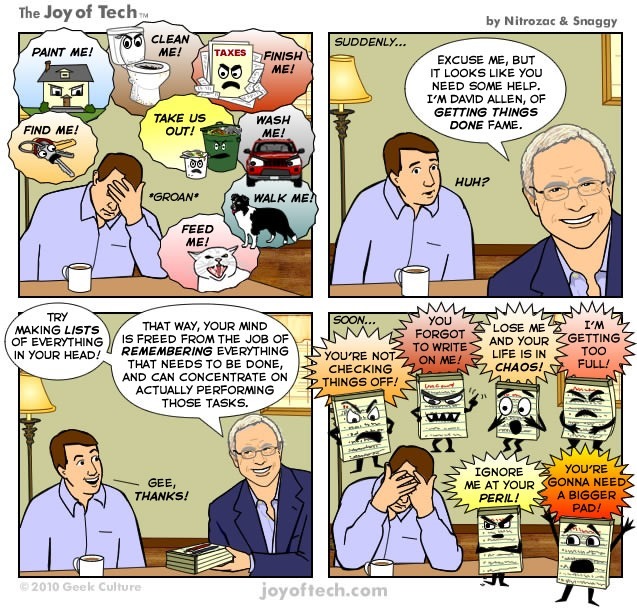 Getting Stuff Done via Joy of Tech. Stuff (workflow): Getting Things Done flow diagram.